Today’s guest teachers are these gorgeous sister angels, Minky Sensei and Misty Sensei. English but we will do our best. It is hard to translate the word, こそ ( = koso), but basically you use it to emphasize the word which comes before. 1) Time related word + こそ ( = koso) : emphasizing the certain time period. When you express your determination to do something in the indicated time period or show strong desire for something that hasn’t been happening up to now. = Kotoshi koso nihongo wo benkyou shimasu. = I will study Japanese very this year. = Kotoshi wa nihongo wo benkyou shimasu. = I will study Japanese this year. = Ashita wa haremasu youni. = I hope the weather will be nice tomorrow. = Ashita koso haremasu youni. = I really hope the weather will be nice tomorrow. = Rainen koso kanojo ga hoshii. = I really want a girlfriend next year. From this sentence, we can tell the speaker hasn’t had a girlfriend this year (or these last few years) but is showing the strong desire to have a girlfriend next year. = Ima koso, minna ga chikara wo awasenakute wa ikenai. = Now is the time for us to work together as a team. = Kondo koso, umaku ikimasu youni. = (It has been failing but) I hope it will work out this time. = Kyou koso, kanojo ni jibun no kimochi wo tsutaemasu. = Today is the very day that I will tell her how I feel about her. = Sumou koso ga nihon no dentoutekina supootsu desu. = Tsurai toki ni issho ni naite kureru tomodachi koso ga hontou no tomodachi desu. = A friend who cries with you when you are having a hard time is your true friend. = Kare koso ga watashitachi ga sagashite ita hito desu. = He is the very man who we have been looking for. = Ai koso ga subete da. = Seijitsusa koso, kekkon aite ni motomeru mono da. = Sincerity is the very thing that I want from someone I marry to. = Tsukareta toki koso, kono sapuri wo nonde hoshii desu. = I want you to take this supplement especially when you are tired. *It is often used with demonstrative pronouns. : That is (was) the very thing ~ . = Sore koso watshi no iitakatta koto desu. = That is exactly what I wanted to say. =Kare, nihongo no sensei wo sagashite irun datte. Oshiete agetara? = I heard he is looking for a Japanese teacher. Why don’t you teach him? = Sorekoso, Maggie sensei ga oshie tara iijanai. = (If that the case) Then you should teach him, Maggie. = Taifuu no toki ni gaishutsu shitara dame dayo. Kega demo shitara sore koso taihen da. = Don’t go out in typhoon OK? What if you (go out and ) get injured? THAT will be a disaster. = Kono aida wa, arigatou gozaimashita. = Thank you very much the other day. = Kochira koso, arigatou gozaimashita. = (I am the one who should thank you.) Thank you very much,too. =Gomeiwaku wo kakete sumimasen deshita. = I am sorry for all the trouble. = Ieie, kochira koso sumimasen deshita. = Oh no. I am the one who should apologize. *When you accuse someone: Look who is talking/you are the one who should be blamed. = Doushite itsumo monku bakari iu no? = How come you are always complaining? = Maggie koso, itsumo monku bakari itteru janai. = You are the one who is always complaining. / You also complain a lot, Maggie. = Ani : 「Doushite heya no souji wo shinain da? Imouto = Jibun no heya koso chirakatte iru janai. Younger sister = (Look who’s talking!) Your room is a big mess, too, you know. = Motokare to mada atte irutte douiu koto? = What do you mean you are still seeing your ex-boyfriend? = Socchi koso, kinou, kawaii ko to aruite itajanai. = What about you? I saw you walking with a cute girl yesterday. = Mou, anata to wa zettai ni awanai kara! = I had it enough. I will never see you again! = Kocchi koso, mou unzari dayo. = That’s my line. I had it enough! *Or sometimes you can use it in a positive way. = Satoru kun wa hontou ni kakkoii ne. = You are really good looking, Satoru. = Megu chan koso, hontou ni kawaii yo. = You are also cute, Megu. Note: You can replace this type of こそ (= koso) with も(=mo) or だって ( = datte) also, but こそ ( = koso) is stronger. We use the particle は ( = wa) to show the contrast. = Nattou wa taberaremasen ga, nihonshoku wa daisuki desu. = Though I can’t eat Natto (fermented soybeans) , I love Japanese food (over all). は ( = wa) here emphasizes 納豆 ( = nattou) shows the contrasts between 納豆 ( = nattou) and other Japanese food. こそ ( = koso) is usually used when you bring up some extreme example. = Nattou koso taberaremasen ga, nihonshoku wa daisuki desu. = Though I can’t eat Natto, I love Japanese food (over all). = Jiko koso okoshite inai kedo, jitensha ni noru toki wa motto ki wo tsukete ne. = Although you didn’t cause an accident, you should be more careful when you ride a bike. = Karera wa kekkon koso shite inai ga mou juunen mo issho ni sunde iru. = Though they are not married, they have been living together over 10 years. = Kurou koso are, kono saito de mina ni nihongo wo oshieru nowa hontou ni tanoshii desu. = Though it is hard, it is so much fun to teach you all the Japanese on this site. = Nankyoku koso, itte inai ga sekaijuu iroirona tokoro wo ryokou shita. = Though I didn’t go to the South Pole, I have traveled around the world. = Hitobanjuu koso, benkou shite wa inai ga nagai jikan ganbatte benkyou shita. = Though I didn’t study all night long, I still studied hard for a long time. = Tousan, shiken wa ukaranakatta keredomo rainen mata ganbaru yo. = Dad, I failed the exam but I will try again next year. = Sore de koso watashi no musuko da. = Kouiu basho ni koso iihito ga atsumatte kurun dayo. = Nice people gathered for this kind of place. = Imade koso waratte irareru ga touji wa mainichi nayande imashita. = I can laugh at it now (because it is over) but I worried about it every day back then. = Konna jidai ni koso, kono eiga wa minakute wa ikenai. = We should see this movie especially at this time. = Doryoku shite koso, kekka ga tsuite kuru. = Only when you make efforts, do you get good results. = Mainichi, benkyou shite koso, nihongo wa umaku narimasu. = Only when you study hard, will your Japanese improve. = Yukari : Maggie sensei atte koso no watashi desu. = Yukari : I am nobody without you./ I am lost without you. = Kare no koto wo shitte iru kara koso shinpai nanda. = I know him very well. That’s why I am worried about him. = Anata no koto wo taisetsu ni omou kara koso ima wa kyori wo okimasu. = I care about you so much. That is why I decided to put some distance between us. = Aredake ganbatta kara koso, daigaku ni ukattan desuyo. = You have studied so hard. That is why you passed the university exam. = Naganen no tsukiaida kara koso iu kedo, saikin chotto tengu ni natte inai? = I am telling you because we have known each other for a long time. I think you are getting a bit stuck up. = Minna ga ite kureta kara koso, tanoshii gakusei seikatsu ga okuremashita. = Since I had you all, I got to have this fun school life. = Thanks to you all, I had a fun school life. = Nihon wa eigo no annai wo mitsukeru no ga taihen desune. = It is hard to find information in English, isn’t it? = Dakara koso, kanji wo benkyou shinakutewa ikenai no desu. = That’s why you have to study kanji. = Maggie dakara koso kouyatte honne de hanaserun dayo. = It is only you, Maggie, that I can tell the truth to. = Fukeiki dakara koso ii toushi wo shinakute wa ikenai. = Since the economy is bad, we have to make a good investment. = Atsui kara koso, motto, ase wo kaita hou ga ii. = Since it is hot, we should sweat more. = Nihongo wa muzukashii kara koso, tanoshii. = Since Japanese is difficult, it is fun to study. ＝ Oyaga genki dakara koso, sukina koto wo shite irareru. = Since my parents are healthy, I can do anything I want. = Ai ga areba koso no jinsei da. = This life is worth it because there is love. = Fan no ouen ga atte koso ima no watashitachi ga arimasu. = Thanks to our fans, we are here now. = Kono seihin wa, mainichi tsukatte koso ii kouka ga demasu. = You can get a good result only if you use this product everyday. マギー先生より= Maggie sensei yori = From Maggie Sensei. = Minky sensei, Misty sensei, arigatou! = Nihon no furui kotowaza ni “Suki koso mono no jouzu nare” to iu no ga arimasu. = Mina no nihongo ga sukidattara zettai ni joutatsu suru to omoimasu. = I bet your Japanese will also improve if you like studying Japanese. = Tanoshin de benkyou shite kudasai. What is あって in this sentence ? Is it the あって　of ある, いる（ existence)? If so, I don’t understand why あって can be used here. Since Maggie sensei is human, not a thing, we should use いる, should n’t we? Please help me this point and thanks as always. You usually use いる for people/animal. In this case, I guess it originally came from 存在（そんざい）existence. Now I know what こそ is in 日本へようこそ. I am wondering what the よう means? For these 2 example sentences, are there any previous lessons that I can look at to understand them better? For the 1st sentence, I don’t understand why it is 勉強してはいない instead of 勉強していない. And for the 2nd one, I think I just have not learned いられる? I tried to look up this word but can’t find anything. You add は to emphasize what comes before (一晩中勉強していない　”I didn’t study all night long”) to show the contrast. Let’s make it more simple. 日本に行ったことがない。I have never been to Japan. 日本には行ったことがない. The same translation, “I have never been to Japan.” but it implies I have been to other places but Japan. Is this いる the same いる as the verb “to exist”? Thank you so much for letting Misty and Minky teach on your site! I actually think Minky ate Misty’s snack, rather than hiding it. ゆかりは”マギー先生、あってこその私です”と言いました。　私もミスティーとミンキーに同じ気持ちがありますね。　!CHECKHEART! Hahaha, so you think Minky sensei is guilty, huh? 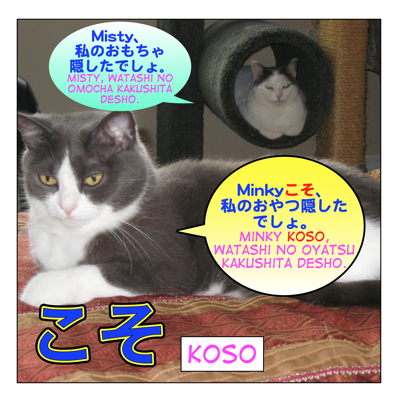 Thank YOU for introducing use Misty and Minky Sensei! They have been a great help! Thanks for the lesson! It is fairly difficult at first, but I don’t have any questions about it for now. But I do have questions about other stuff again! hahaha. I was studying a test my teacher gave me, and now I have 2 problems I am not really sure about. I am supposed to choose the correct order for 4 options to make the complete sentence. would it be wrong to say it without the は? Why do I need to use the は in this case? 2- This one seemed way more confusing to me. I am not even sure this is right. So I am not sure about this. It seems like that が should be a の or something like that. Nothing I make sounds right in that sentence. How would it be? Is one of the options wrong? Is there an extra が that shouldn’t be there? 1. Yes, you can say 会社へ（に）何で行っていますか” / 何で会社へ（に）行っていますか？ without using は. When you show the contrast, you use the particle は. So the speaker wants to know what kind of transportation the listener uses especially when he/she goes to work. So the clause has to modify a noun which comes after. OOOOOOOOOOOOHHHHHHHHHHHH! Thanks! I got too focused on the が itself and forgot to read it as a whole. 日本語がかんたんな本がいいです = A book with simple japanese would be okay for me. So 日本語がかんたんな is adding that “simple japanese” characteristic to 本, right? It feels like it was right in front of me and I didn’t see it. Yes, if there is “の” , もう少し簡単な日本語の本がいいです works too. 1. 今でこそ笑っていられるが当時は毎日悩んでいました。 Could you explain why “今で” instead of just “今”? 2. 彼らは結婚こそしていないがもう１０年も一緒に住んでいる。 Would it be possible to place “こそ” behind “していない”? 3. 努力してこそ、結果がついてくる。 This is the only example for Verb+ こそ, however, it’s the te-form and therefore is identical to the V-te+ こそ meaning, isn’t it? Can you think of an example of Verb+ こそ without the te-form? Thank you for spotting the type as always. 今でこそ= is used when you refer to your current state looking back the past. But I will add more example sentences for ~て+こそ later. Thank you for the correction, I too really appreciate it. I read the monka/monda lesson of yours, but I can’t figure out why it’s necessary here and what function it has. And why is わけではない not appropriate in my sentence? This lesson IS the one I had been waiting for. I deleted わけではない in your previous sentence because it was not quite natural. Did you want to say this? Though you knew wouldn’t be able to understand the whole lesson, you were looking forward to this lesson. But when we put these two sentence together, it doesn’t sound natural. I think it is because you can’t tell you wouldn’t understand all of it before you read my lesson. How about switching the sentence? Imade koso waratte irareru ga touji wa mainichi [nayannde] [nayande] imashita. Doryoku shite koso, kekka ga tsuite kuru. = Only when you make efforts, !koujichuu! ﻿﻿[do] you get good results. Only when you make efforts, you get good results/good results will come. Thank you for spotting the typos. I really appreciate it. Only when you make efforts…. →When you start a sentence with “only”, you have to change the word order. So I will leave the way it is. Konobunha “ashitaha hareruto iina” toonajidesuka? Yes, they mean the same but “youni” shows your stronger desire.